One of Canada's endangered birds of prey visited a local school on Wednesday. Bird handler Emma Stainton with peregrine falcon Falon. 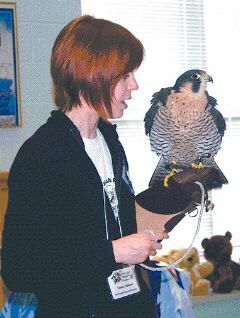 Falon, a five-year-old peregrine falcon, spread its wings and ruffled its feathers for a room of Woodland Park Public School students. Many questions were asked but students sat still and quiet while trained handler Emma Stainton took Falon out of its cage. Stainton, an outreach programs educator for the Canadian Peregrine Foundation, said visiting schools is important because students can spread the word about the risks peregrines face and the need for a safe habitat. Recently, the foundation issued an urgent call for Canadian governments to protest the planned legislation in the United States that would permit trapping and harvesting peregrine falcons. This news follows the Ontario government's decision to down-list the peregrine falcon from an endangered to threatened status, the foundation said in a statement. Stainton said she admires and shares the foundation's passion for the bird. "We take this very seriously," she said. For more information, visit www.peregrine-foundation.ca.